Turtle Moon Studios. Susan Shie. 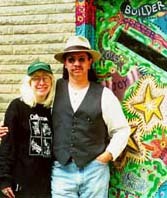 Turtle Trax 11-3-99. We're in the midst of our first snow of the season, in Ohio!!!! Above is the little 4" sewing lesson sample that I began at our residency at Island Press, The Collaborative Print Workshop of Washington U in St. Louis last week. I don't have pix of this last part of the week's activities yet, since I don't use a digital camera, but will hopefully add them later. About seven students and the Master Printer sat there, following me through my sewing lessons, to stitch their own little Pyrex cups, for future reference for the huge project they are embarking on with us. I'll tell you all about it, at the end of this diary entry. This last weekend we went back on Slow Time, which is the old term for what everyone now calls "not Daylight Saving Time." DST used to be called Fast Time. I prefer having Slow Time, and revel in the extra hour of sleep I get that first night! I despise going on Fast Time and losing a precious hour of sleep. How I love to dream!!!!! I am pretty good at complaining, too, if I manage to make a whole paragraph about how I don't like Fast Time!!! Sorry! Anyhow, it is snowing now, for the first time this season. It was all rain til mid-afternoon, after which we got both rain and some pretty healthy looking snowflakes. They have mostly melted on impact with the warm earth. After all, we were having weather Hawaii could be proud of, for about a week! Now the temp is dropping fast, and we may see some accumulation tomorrow. Well, that may be my natural Ohio enthusiasm for the first snow. We tend to be thrilled by it, at least up through Christmas. Then we whine. But for now, let us amble back in time, to the lush post-drought month of August. This is a picture Robin Schwalb sent me, after she'd been here to visit in August. I just had to add it to this diary, since it really shows you our distinguished flock of wild turkeys, who have taken over our suburban neighborhood! They just wander around and stay over winters! Jimmy is standing on the right, and the way Robin shot the picture, Jimmy's inside the green plexiglass heart that hangs from our windchimes on the patio. Looks like he's Big Green Heart Man!!!! Like he walks around in a see-through heart suit!! I think it's a really nice "happy accident." He really does have a huge heart, and green is the color of healing and of nature. Later, in September, I finished quilting this piece for Frances Alford of Austin, TX. She ordered it in January, when she was here for a Turtle Art Camp, and she was very patient! With its borders, "St. Quilta the Comforter Brings You Her Chicken Soup, #4" came out 16.5" high and 11" wide. You can order St. Quilta paintings on fabric or quiltlets made from them, right here on the site. I have a waiting list to quilt them, but time goes fast! Before you know it, I'm working on your own special piece! And of course there are saintcards to buy, based on all the St.Q paintings I've made. Jimmy with yet another bride? Nah. One wife is scary enough for him! This is his niece, and her husband is off camera, doing something else!!! On Sept. 11, Jimmy's niece Lisa Oswald married Dudé Robinson, in a very pretty gazebo setting in Orr Park, in Orrville, near Wooster. Lisa is Jimmy's sister Karen's daughter. We all had a good time, and the weather was gorgeous. It reminded me of Jimmy and my wedding day, June 30, 1990, when we got married in a gazebo in Christmas Run Park in Wooster. Something about those outdoor weddings, with the birds singing and the breezes blowing! Hurray for love! September 15 to 21 was the week of our Turtle Art Camp with Janet Ghio of Columbia, MO, and Ethel Baxter of Dayton, OH. Janet had a bad cold, which she'd caught on the plane ride here, but she kept making art the whole time, and didn't even miss a meal!!! What a trooper! Ethel, who is a devotee of cats, was in Cat Heaven here, though she really missed her own two kitties at home. In the above photo, Jimmy is showing the girls how he wet molds leather cases over wooden forms he's made, and then tools in the images of fish, flies, etc, into them. Some of our campers go over into his studio and work with leather, as well as with painting, airbrush, and sewing, but this duo focused more in MY studio. Before we knew it, my Libra birthday rolled around, on September 28, and I turned a sassy 49!!! Jimmy, dear heart that he is (as we all know, from the photo with the turkeys, above, right?) bought me a live magnolia tree and planted it in the front yard, between a big pine tree and our Moon Garden. It's a Jane Magnolia, according to its little tag, so we both figured it's named after my birthday sister Jane Bates, as well as my partner in art crimes, Jane Burch Cochran. Anyhow, we'll both take good care of Birthday Jane Magnolia, and try to keep her warm this winter! Anyone who has hot tips on how to care for magnolia trees, please let me know! I sure don't want to have her die of a cold! We took a whole bunch of pictures on my birthday, to kind of document the day's thrilling activities! Here is a pretty normal scene: me gathering Four O'Clock seeds. I was still gathering them yesterday, since we hadn't had a really killing frost yet this year! But I think this cruddy weather snap may do them in! I have a ton of Four O'Clock seeds, as well as a healthy amount of golden cosmos seeds and a few magenta cosmos seeds. I find gathering seeds to be a wonderfully Zen thing to do, as good or better than cleaning the leaves off my little Medicine Wheel down by the He-Man Woman Haters Clubhouse. The marigold seeds I leave in place over the winter, as they seem to need to freeze, in order to reproduce. Well, OK, I may experiment with taking some in and keeping them from freezing, like I have before, but only a few are dried out on the plants so far. The most obviously dead thing in the garden is poor old Doris, the scarecrow. She's not REALLY dead, just very faded. Ta Da! Another St. Quilta piece got finished in mid October, this time for Sharon Rosenblatt, of Alexandria, VA. Poor Sharon ordered this piece in March, when we were teaching at Arrowmont, and had to wait a while to get it. "St. Quilta the Comforter Celebrates with Joy #4" is 20" high and 14" wide. I think there is only one of the paintings of this series left now, so if you're interested, let me know soon! 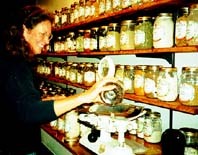 Here's our friend Laura Saeger, a long time Wooster Food Co-op member, measuring out her bulk herbs at the new store. The bulk herbs and spices have always been one of the Co-op's best features!!!!! How we love those crazy little scales! At the end of September, the Wooster Food Co-op moved from its old home of 21 years in a stately old house just off downtown, to a storefront on our main drag. The Co-op's first two locations had been stores downtown, and both had been taken away by urban renewal. The big old house at the corner of Grant and North Sts. has now been purchased by the county, and will be torn down, to once again make way for a new project. We all hope the store can stay put for a long time now, a half block from the Square, and next to the used books store!!! And this time it even has a café included, for natural food snacks and lunches! Early in October, Art Quilt Network, (AQN) met for its Fall, 99 retreat at The Pontifical College Josephinum in Columbus, OH, where we usually meet. Here is David Walker, a good friend, long time member of AQN, and well known artist and teacher from Cincinnati, OH, showing us his quilts. Each time we gather, two AQN members are chosen to present an overview of their work. David even showed us his baby pictures and his roller skating outfits and partners, from his high school days. It was a wonderful presentation. David's big quilts, spread out on the floor together, made a brilliant artwork of their images combined! I really like this photo, which Janet Ghio took of us in Sept, when she was here for camp. She gave it to us in St. Louis last week, when we gave a slide lecture of our work at The City Museum, during Quilt National's venue there. Now that is one wild museum, full of incredible visionary art. I hear the owners are two wacked out artists!!!! I thought the city owned it, til I was inside! It looks like a combo of Rev Howard Finster and St. EOM and ME!!!! A huge old factory turned folk art installation EVERYWHERE! If you get anywhere near St. Louis, you have to see it! Quilt National was the most tame thing being shown there, but it still fit in well!!! In St Louis, a charity that helps women in crisis hosts QN every two years, right after the show goes down in Athens. I think it's the best way to marry the topics of quilts and women, to have this women's self help center benefit from the show. And this year 500 St. Louis women each donated $200 to the charity, the money all going directly to the women's center, as part of the project. Paying to have Quilt National there was done with admission tickets to see the show itself. Stunning! We went to St. Louis as invited artists to work with Island Press, the Collaborative Print Workshop of Washington University. They have an excellent program, in which they select artists from around the country, to come create an edition of prints with the press. There are about 20 students, both undergrad and grad, and four or five profs, as well as the Master Printer, Maryanne Simmons. Above we were looking at the central panel (and the ONLY panel so far!!!) of a quilt, the beginning of The Cookbook/Hierophant: Card #5 in The Kitchen Tarot. We had just gotten to the school, after our flight on Oct 25, and were eating lunch and trying to learn names and feel our way around the new environment. It was a really friendly group!!! We all thought this particular card was good for all of us, since in Tarot, the Hierophant is the rule enforcer, the person obsessed with the status quo. And we are all real iconoclasts. Island Press takes many liberties with traditional printing processes and rules, and we, well, we....Well, just look at us and our art! Enough said!! After tracing the images onto Copylex, which is similar to acetate, the printers cut plates out of Cintra, which is a smooth white plastic product. They used a tool called a Cutawl, which clothing manufacturers used to work with, to cut many layers of fabric at once. Then we began to develop the Cintra into callographic print plates, by applying stuff like metal filings in Roplex, to the surface, and by cutting into the surface with things like woodburners and Dremmel tools. The central panel became something like ten different callographic plates, one of which is shown above here. The Carborundum/Roplex goop handled a lot like finger paint, and I used a brush to apply it and texture it. After Jimmy and I slaved away on these plates a while, we asked Maryanne to enlist the students, and soon they were also drilling and brushing!!! It was great! A regular art factory had begun!!!!!!! Here Maryanne and Jimmy are considering more choices, discussing them with Joan Hall, head of the department (not in the photo). Lily Street, a grad student, is paying attention, too. She ended up being Jimmy's apprentice for the leatherwork that will go onto every print in the edition of 16 printed, padded, painted, stitched, quilted, beaded, and embellished QUILTS!!!!! In the photo, our original quilted painting in its beginning stage, is lying next to all the plates for its print replicas. Here the printers have laid another layer of Copylex over the original drawings for all the plates...after I'd drawn side, top, and bottom plate designs before then. I am writing on this second layer of clear plastic, which we thought would become the lithography print plates pattern, and which would be printed over the callographed fabric prints. Later we decided it would be way more interesting for me to hand write diary stories on each print in the edition, as it was prepared, in order in time. The plan now is that each "quilt" will be printed, sent to me for its writing, off the top of my head, and then sent back for MUCH sewing,etc. This way, each quilt/print in a series of 16 made, will have its own narrative. If the 16 prints and our quilt, which we'll also make, but not as prints, are all shown together ever, there will be 17 different narratives to read. Are you following this? It does sound pretty confusing, since who would be so crazy as to make 16 quilts like one of our super time consuming quilts!!!?????? Hope they don't burn out!!! Maryanne thinks they'll work on it for three years, and I can vouch for the time needed! Each quilt will be around six feet tall, with each plate turned into a finished quilted panel, before sewing them all together into one big piece. 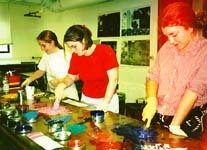 Here are Amanda, Becky, and Sarah, undergrad print majors, mixing colors of printer's inks. 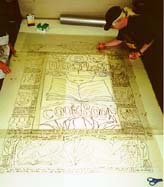 A large part of the time we spent there was devoted to finding colors for our prints. We ourselves were not allowed to ink the plates, since they knew we wouldn't be doing that part later. We just had to stand there and go, "Yes, I like that. No, that's too blotchy. We have to take out some of that muddiness. We need more color there, less there." Well, actually I did most of that. Jimmy was kept busy teaching Lily to tool leather, for the 32 Pyrex measuring cups she will make for the whole project. And then there are the recipe cards, with woodburned titles of recipes of ours, Gretchen's, and our mothers'. Those will finally get sewn along the edges of the print/quilts. Also I made little drawings for plates for Artist's Proof, TP ?? ?, and all the numbers in the edition, like #7/16. And in the last two days of the session, we got about six full proofs inked, including all the side, top, and bottom panels of the quilt/print. But pictures showing all those lovely colors together, hanging side by side, are sadly still in my little Olympus Stylus camera! My two favorite things we did were getting to paint right on the printed fabric proofs, with a brush, after some foam brushed in inks had been added to the plates, after the main colors had been rubbed in with the tarletons, AND sitting down to give sewing lessons in the Lucky School of Quilting Techniques!!! In both cases, I forgot how tired my legs felt, from standing on cement all day all week. I just went into Automatic, when I could sew or paint. I am doing my utmost to turn Island Press into painting and sewing devotees!!!!! Bless their hearts, they are very accomodating, good sports, who've bitten off a big chunk of quilt art!!!! We are so happy to have been invited to do this project. Joyce Scott, Nick Cave, Jaune Quick-to-See Smith, Jody Pinto, and Juan Sanchez are some of the artists Island Press has already been working with. We are proud of keeping this distinguished company, and truly had a blast, working with such dedicated faculty and students. My printmaking education is just Printmaking I and II at The College of Wooster, where I had a wonderful prof with a classical approach, George Olsen. And Jimmy had never made prints before. There will be a lot of interaction over the three year estimated time of the project to make these quilt/prints. Email, us going back there, a few of them coming here to camp, and the pieces being shipped back and forth will keep us connected. But we are seriously working on "Issie's Trailer Court" now, and plan to really finish it in the next few months, before we work any more on "The Cookbook/Hierophant." Then, when we do work on it, I'll draw the new panels freshly, not going by what we did for Island Press. At least, I'll draw them freehand, "after" what I remember the plate designs I made last week to be! There will definitely be a bunch of measuring cups and measuring spoons, and, at the bottom, the naked lady reading a cookbook! What a residency!!!!! You can tell we're both excited! And besides that project, in the last two months, the book for the Women of Taste project came out, and I juried the national show "The Artist as Quiltmaker IX" at FAVA in Oberlin, OH. While we were in St. Louis, Mom broke her ankle at the nursing home, and will be in a soft cast for six weeks!!!! Poor sweetie! How I wish my parents' lives could be all peace and happiness! Now we're ready to bop down to Columbus, for the opening of a show we're in, called "Transcending Traditions: Ohio Artists in Clay and Fiber." At the Riffe Gallery of the Ohio Arts Council, this will have six ceramists and six fiber artists in it, and Janice Lessman-Moss curated the fiber part of it. Then we drive down to Athens, OH, for a two week residency at Passion Works, part of ATCO, the Athens County Sheltered Workshop. We'll work as visiting artists with Patty Mitchell, the Artist in Residence there, who's really turned the place into a magical experience for so many people! The people who work at Passion Works Studio have developmental disabilities, and they make some far out and wonderous art!!!! There are some great greeting cards they've made, on their site! Have a good time! We'll be back around January 5, if Y2K doesn't get us!!! I'll have some more big ones to tell you! Don't let the horse kick you, Dad sez.